Physician acceptance of new Medicaid patients has shown to be lower than acceptance of new Medicare patients or new privately insured patients. Acceptance of new Medicaid patients also has shown to be lower in states with lower Medicaid payment rates to physicians. Using the 2013 National Electronic Health Records Survey, this NCHS report summarizes physician acceptance of new patients with Medicaid, Medicare, and private insurance. It also summarizes information on how these acceptance rates vary by select physician characteristics and by state. In 2013, most office-based physicians (95.3%) were accepting new patients. 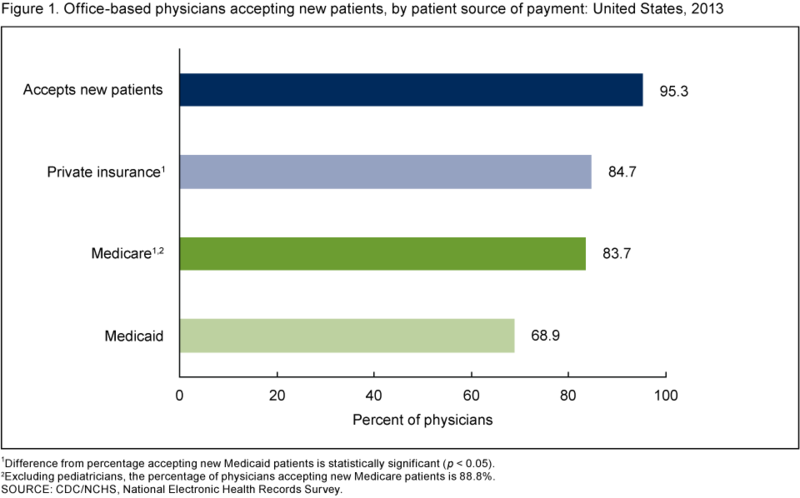 The percentage of physicians accepting new Medicaid patients (68.9%) was lower than the percentage accepting new Medicare (83.7%) or new privately insured (84.7%) patients. The percentage of physicians accepting new Medicaid and Medicare patients was lower for physicians within metropolitan statistical areas (MSAs) compared with physicians outside of MSAs. The percentage of physicians who accepted new privately insured, Medicare, and Medicaid patients each varied by state. This entry was posted on Tuesday, March 31st, 2015 at 2:41 pm and is filed under National Electronic Health Records Survey. You can follow any responses to this entry through the RSS 2.0 feed. You can leave a response, or trackback from your own site.